The concept of the kitchen island evolved out of a need for a central working counter. In the earliest days of the formal kitchen space, a table fulfilled this role, and over the centuries this basic idea has shaped our concept of what a functional, working kitchen might look like. Today’s kitchen islands are designed to handle a variety of functions, including food prep, informal dining, entertaining, as a station for cleanup after meals, or even a place for the kids to do their homework. 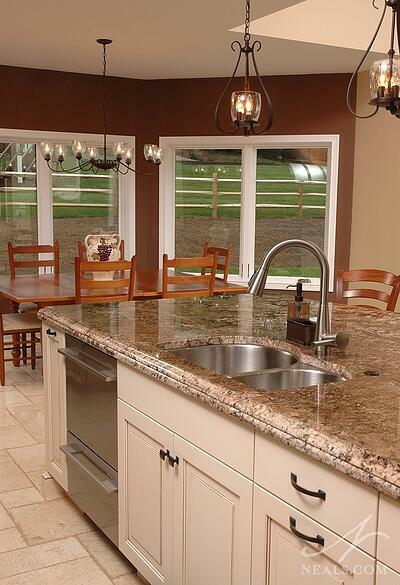 If you’re planning to remodel your kitchen, there are many options for designing an island that meets your needs. An island should fit your kitchen. Islands will not work in kitchen spaces that are less than 8 feet by 12 feet because they require adequate clearance space to be functional. The National Kitchen and Bath Association (NKBA) guidelines recommend an optimal allowance of a 42-inch aisle around the island, especially on sides facing appliances where there are door swings to account for, and 48 inches for two cooks. With that said, depending on how the kitchen is laid out, the minimum aisle width should be at least 36” to be functional. The minimum counter width of an island should be 24 inches. The height of an island can be varied based on function. 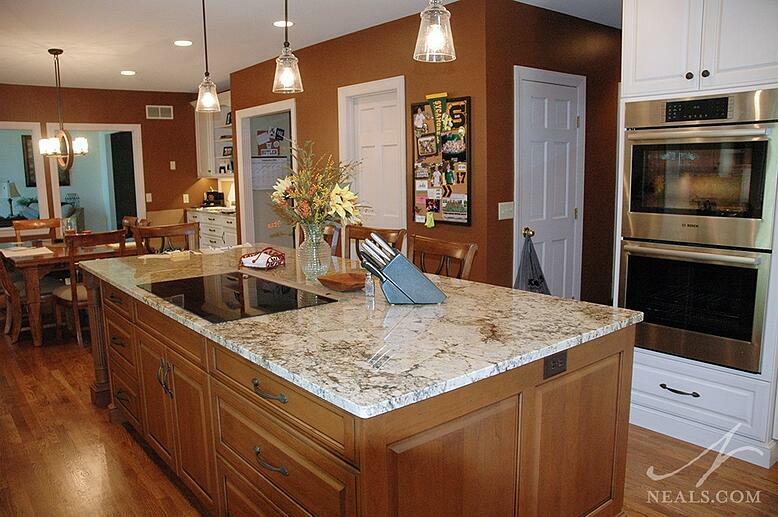 The standard kitchen countertop height is 36 inches. This is the height that most people feel comfortable with when working in the kitchen. The standard height of a dining table is 28 inches to 30 inches. Bar height tables are typically 40-inch and 42-inch. An island can be a good spot for a cooktop. 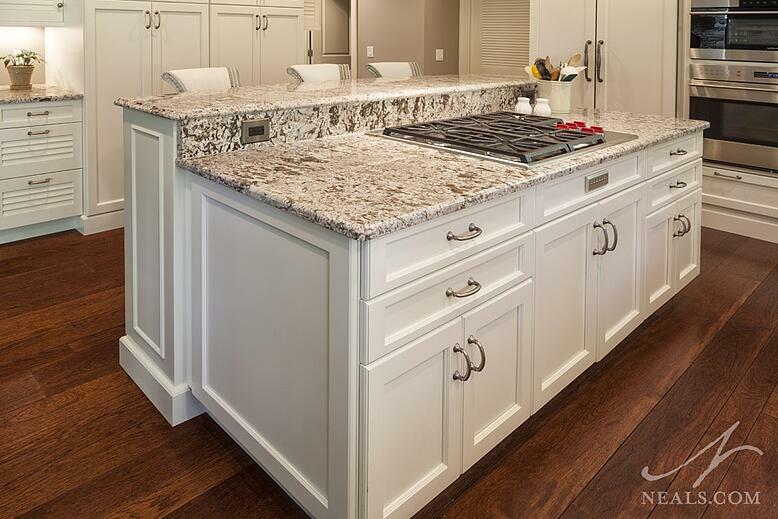 Island cooktops should allow 12 inches of counter space on each side and 9 inches behind for safety. A cooktop will require venting and the two options are downdraft venting designed for island cooktops or overhead venting. You should discuss venting with your contractor before selecting products. If you plan to add a microwave oven, dishwasher or an under-cabinet refrigerator for beverages to the island, consider the door-swings in your design. 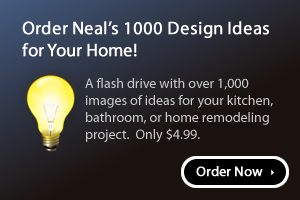 Also, consider the placement of electrical outlets on the island for operating small appliances such as mixers, blenders, food processors and crockpots. An island can be a great place for a sink. If an island sink is in your plans, how will you use it? Will it be the primary sink for the kitchen or a prep/bar sink? Bar sinks come in a variety of shapes and sizes. For food prep, the sink should be at least 16 inches by 16 inches and 8 inches deep. 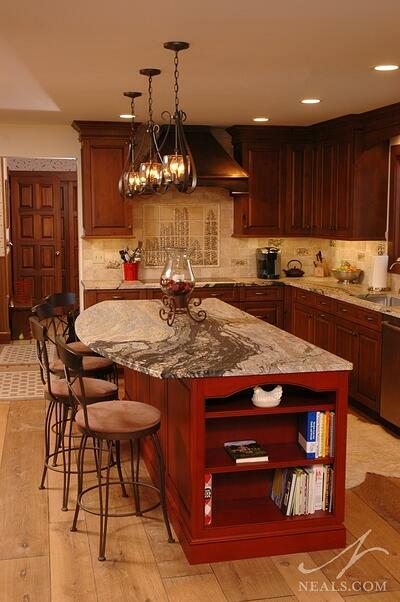 A kitchen island is a work center and storage should be geared toward the primary functions of the island. If the island will also be used for entertaining, consider adding storage for wine, glassware and serving bowls and dishes. If you love to cook, create storage for spices, bake-ware, cutting boards, sheet-pans, utensils and cookbooks. Identify the items you need to store on the island. In creating an island you may want to consider custom or semi-custom cabinetry to make the unit as efficient as possible. Consider open shelving to keep contents at hand; vertical storage for baking sheets and cutting boards; deep drawers for pots, pans, bowls and bake-ware; narrow drawers for spices and utensils; and pullouts for easy access to items stored in base cabinets. If you plan to include cabinets in a seating area of the island where you have to move stools to access contents, store items you use infrequently in the space. Allow 24” width per person for comfortable seating at an island. Counter height should also be factored in to determine the allotment for knee depth. The higher the counter, the less space will be needed for knee depth. The knee depth for a 42-inch counter is 12 inches; 15 inches for a 36-inch counter and 18 inches for a 30-inch counter. Seats for the island should allow 8 inches to 12 inches of leg room beneath the counter.